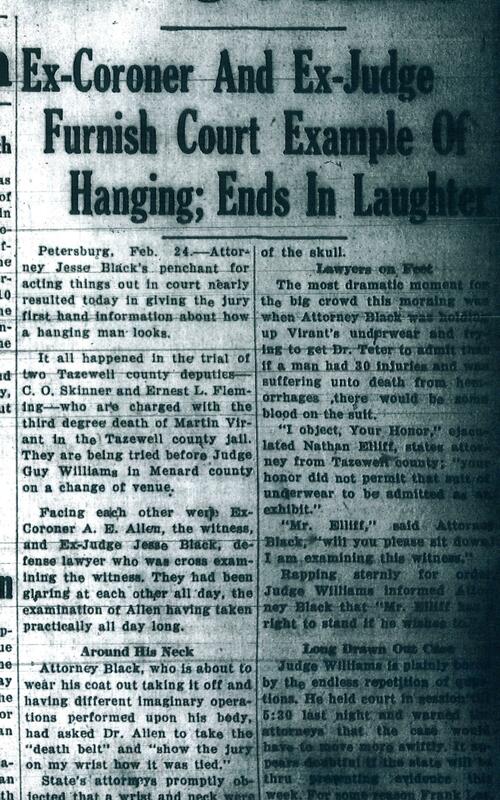 In the month following the shocking death of Tazewell County Jail inmate Martin Virant on Sept. 1, 1932, readers of local newspapers saw a deluge of articles and sensational banner headlines announcing each new development in the story. With the grand jury manslaughter indictments of three Tazewell County deputies in connection with Virant’s death, news coverage slowed down markedly, as the case began to wend its methodical way through the criminal justice system. That initial flood of news coverage, however, was enough to convince Judge Joseph E. Daily that the accused deputies, Ernest L. Fleming, Charles O. Skinner and Frank Lee, would be unlikely to get a fair and impartial trial in Tazewell County. 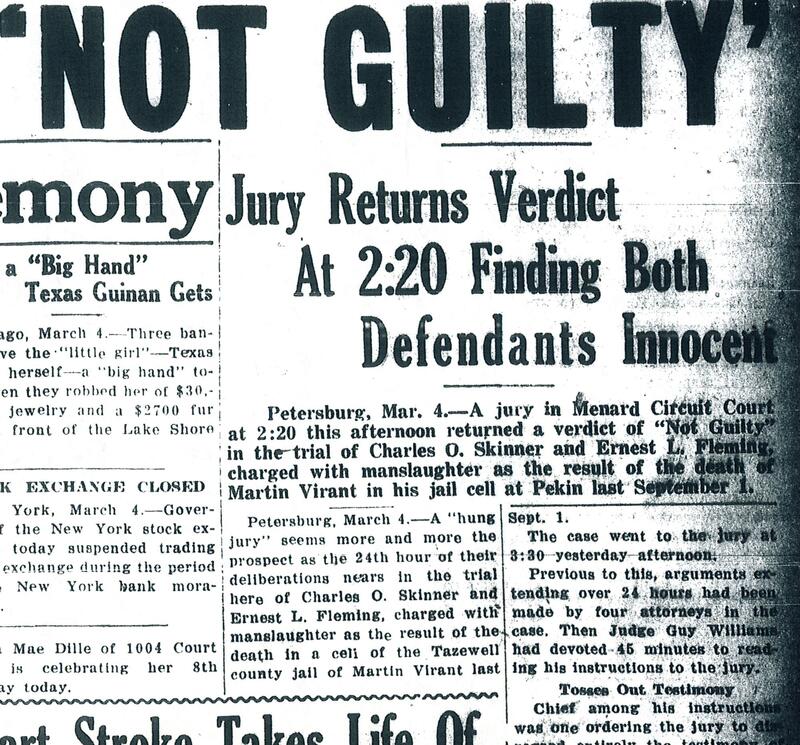 On Nov. 12, 1932, Daily ruled that the trial of the deputies would have to be moved to Menard County, where the case was expected to go before a judge in February of 1933. The Pekin Daily Times, which had been following this case in minute detail, continued to provide meticulous coverage of the story even after the change of venue. Daily Times publisher F.F. McNaughton sent one of his reporters, young Miss Mildred Beardsley, to Petersburg to cover the trial for the newspaper. Throughout the course of the trial, Beardsley would offer very lengthy and extensive transcripts of witness testimony as well as occasionally filling in the background with local color and explanation of legal niceties. The deputies were to be defended by a team of three talented, veteran attorneys: Jesse Black Jr. and William J. Reardon, who represented Fleming and Skinner, and J. M. Powers, who represented Lee. The prosecution team was made up of Menard County State’s Attorney J. W. Smoot, Tazewell County State’s Attorney Nathan T. Elliff, and East Peoria attorney Noble Y. Dowell, a friend of the Virant family brought on to assist Smoot and Elliff in what was for most of the attorneys probably (and for Elliff, certainly) the greatest case of their careers. Presiding over the trial would be Menard County Circuit Court Judge Guy Williams. Although the deputies had already been indicted by a Tazewell County grand jury, due to the change of venue they were re-indicted in Menard County on Feb. 13, 1933. At that time, prosecutors agreed to simplify the case by dropping three of the eight counts of manslaughter that each of the deputies had faced in their Tazewell County bills of indictment. 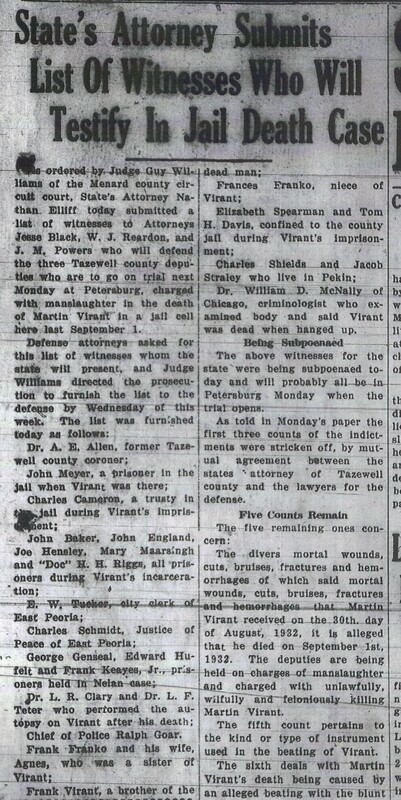 Two days later, the prosecutors disclosed the list of witnesses they intended to call – 25 people, including medical experts, family members and acquaintances of Virant, and several individuals who were inmates of the Tazewell County Jail at the time their fellow inmate Virant was beaten to death. This detail from the front page of the Feb. 15, 1933 Pekin Daily Times shows the list of witnesses whom the prosecution intended to call during the trial of the Tazewell County Sheriff’s deputies accused of beating jail inmate Martin Virant to death. On Monday, Feb. 20, 1933, jury selection for the trial got under way – but not before a significant development that morning: the state agreed to drop all charges against Deputy Frank Lee. “It is understood that Deputy Lee was away from Pekin during much of the time during which the events in controversy took place,” the Pekin Daily Times explained. Evidently the prosecution did not feel it would be possible to establish beyond a reasonable doubt that Lee was at the jail during the times when Virant was beaten and hanged to make it appear that he had committed suicide. Jury selection then proceeded throughout the rest of Monday and concluded on Tuesday, Feb. 21. The jurors chosen were: J. Kennedy Kincaid, farmer, Athens; Robert Fitzgerald, farmer, Sugar Grove; Donald Baugher, general store clerk, Fancy Prairie; Ted Buelter, repairman, Petersburg; Theodore Reinders, hardware merchant, Athens; Otis Harris, farmer, Athens; Roy Corkey, farmer, Petersburg; William Montgomery, farmer, Petersburg; John Gaddie, farmer, Greenview; Henry Market, farmer, Sand Ridge; James Bradley, farmer, Petersburg; and Charles Lockhart Jr., farmer, Greenview. Over the next 10 days, the 12 jurors would be called upon to hear and consider a long litany of evidence and hours of testimony and arguments both for and against conviction. After the jury had been sworn in Tuesday, the defense team won a critical victory. Black and Reardon moved that the testimony of Martin Virant at the Lew Nelan inquest be ruled to be inadmissible hearsay. During his inquest testimony, Virant had shown and described his extensive injuries and had boldly accused Tazewell County deputies of nearly beating him to death. Virant had specifically named Skinner as one of the deputies who had tortured him. The ruling made the state’s task more difficult, but Smoot and Elliff did not think it posed an insurmountable obstacle. Elliff immediately proceeded with his opening statements. Next week: The state presents its case.